Music is part of our souls. It can heal, it can hurt, it’s like a sense memory. We’ve lost great artists in their prime like, Leonard Cohen, Kurt Cobain, and Elliot Smith. The impact of their death is felt each time we hear one of their songs. Imagine, for a moment, that your very favorite artist suddenly dies. Now imagine you were married to them. This is the very premise of TUMBLEDOWN. Hannah is the widow of indie folk singer Hunter Miles. She is hounded by gossip seekers on a daily basis. When Hofstra professor and true fan Andrew tries to get in touch with her, she brushes him off… and brushes him off again… and again. Only until realizing that her dream of writing Hunter’s story is one she cannot accomplish on her own, does she let her highly guarded heart open just a crack. Andrew and Hannah strike a deal; Andrew writes a biography on her terms for $50k. With the encouragement of his music industry girlfriend Finley, Andrew drives from NYC to Maine and moves into Hannah’s guest bedroom. He is then exposed to a world a true fan can only dream of, with one massive catch. Hannah will not stop mourning her late husband. Can fan and family see eye to eye. Can trust break down the walls of Hannah’s suffering? Will intellect stifle healing. In a film where it’s head vs heart, who wins? Rebecca Hall is flawless as Hannah. Witty, independent, strong headed, Hall plays a woman unwilling to move on with her life. Jason Sudeikis as Andrew is unstoppable. Smart, and quippy as ever, this role is something new for Sudeikis. I love this side of him and hope that the industry, and more writers, take note of his innate ability to be funny in a non-slapstick kind of way. These two are an absolute powerhouse as they match wits with one another in each scene. Rounding out an incredible cast is Dianna Agron as Finley. Life after GLEE fame should treat her well if she keeps up such a strong, believable presence on the big screen. Blythe Danner and Richard Masur play Hannah’s parents. Deeply supportive and yet totally realistic, these two are the perfect counter balance to Andrew’s inability to let go of presumption. Finally, Griffin Dunne plays Hannah’s editor and owner of the town beloved book shop. He brings warmth and charm only a small town holds. The film was 8 years in the making. Writer Desi Van Til thoughtfully crafted this story partly as a personal healing piece for a lost friend. She skillfully captures the heart of New England, the desperation of grief, and the hold that music has on everyone’s heart. For Director Sean Mewshaw, his first feature length film is a total success. It’s shot in such a way that truly shows the quaintness of the area. Finding “Hunter Miles” or singer Damien Jurado was one of his triumphs. He perfectly encapsulates the feel of the character that was created by Desi, Rebecca, Jason, and Sean. Coming in after the film was already in the can, with his music and lyrics, he “created” a musician we’re all discovering for the first time, but feel like we’ve now lost as well. It might also help that Sean and Desi are husband and wife! This team is a real tour de force and without any solid knowledge (only mere mentions) I predict many captivating projects coming down the pipeline from these two. Grief is something so personal. No matter how big the hit we feel, it still leaves a hole in our hearts and souls. Sometimes music helps. Sometimes it’s a trigger. Either way, the songs live on long after we’re gone. So sing, I say. TUMBLEDOWN is easily in my top three narrative selections to come out the this year’s festival. It is a must see and definitely a must hear. I was fortunate enough to attend a roundtable interview with Dianna Agron, Jason Sudeikis, Desi Van Til and Sean Mewshaw. We talk issues from the film, insight into the project’s journey, as well as Jason and Dianna’s other releases at the fest. Take a listen to the absolute joy around the table: *You can hear me ask a question about journalistic responsibility and one about Dianna’s similarities to the character of Hannah. * Enjoy the voices of TUMBLEDOWN! 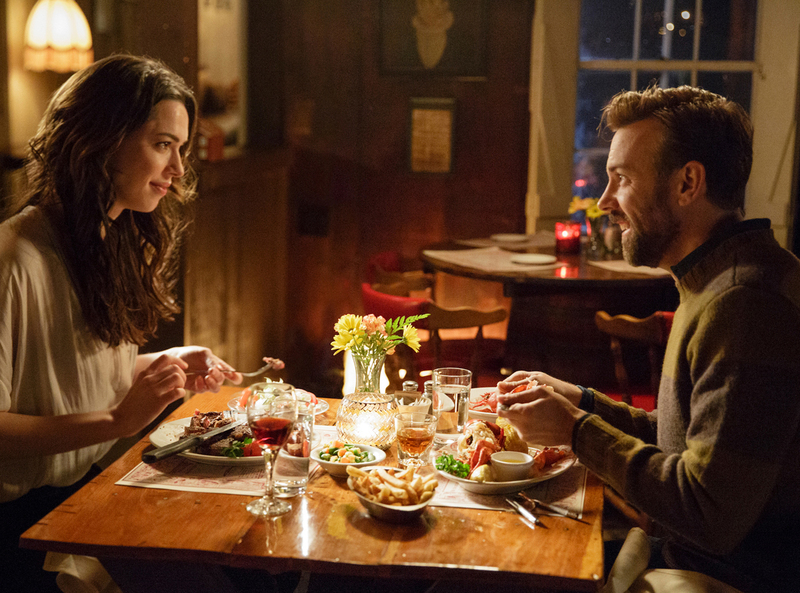 You can still catch a screening of TUMBLEDOWN at the fest this Thursday!! I cannot imagine this film not getting distribution. We will most certainly keep you updated here at RND. This entry was posted in Events, Features, Film Festival, Girls on Film Podcast, Go To The Movies, Interviews, Liz, New York City, New York City, Page to Screen, Podcasts, Reviews, Screenings, Tribeca Film Festival, What To Watch This Week, Woman Lead, Women in Film and tagged blythe danner, curt cobain, damien jurado, desi van til, dianna agron, elliot smith, GLEE, grief, griffin dunne, hunter miles, husband and wife, indie folk, interview, Jason Sudeikis, leonard cohen, loss, maine, musicians, New England, NYC, rebecca hall, Review, richard masur, rom-com, roundtable, sean mewshaw, tff, tff2015, tff2015 liz, tribeca film festival 2015, Tumbledown, writer by Liz Whittemore. Bookmark the permalink.